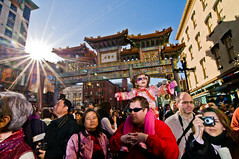 We’re big fans of the folks over at Photowalk DC and this Sunday, they’re doing a great photowalk at National Archives and the Chinatown New Years Parade. They’ve got things scheduled out pretty well, so if you can’t make the whole thing, you can come out for part of it, and meet up with them according to the schedule. Get out with your camera, be it a point and shoot or the fanciest of SLRs, it’s worth it to go meet other shooters in your town. Thanks Tom. We hope to see you and some of your We Love DC staff out there. I’m a little confused (nothing new) – is the photowalk on Saturday as referred to in the copy or Sunday as referred to in the headline? It’s Sunday, as confirmed by the link in the post. The editorial gremlins have fixed it. NP.No harm done, you caought us…I for one will look for you sometime between 1:30 amd 1:45 near the Chinatown metro..